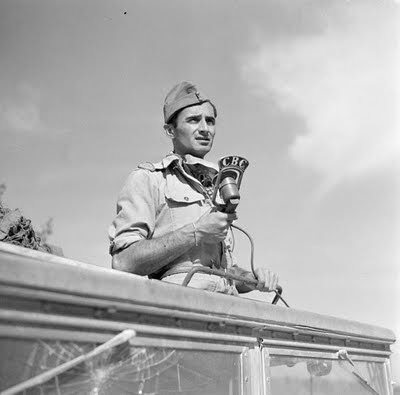 War correspondent Peter Stursberg of the CBC records a radio broadcast from Potenza, Italy, on Sept. 22, 1943. Photograph by Frank Royal, Collections Canada, No. 3207587. On Aug. 31, a Thursday, Peter Stursberg celebrated his 26th birthday. The next day, Germany invaded Poland. Two days later, Britain and France declared war on Germany, a week before Canada would do so. Mr. Stursberg spent Saturday night at a dance at the Empress Hotel in Victoria, then stayed up late at a friend’s house listening to band music when the program was interrupted for a bulletin from London. He went for a long walk along the Victoria waterfront the following morning, admiring the quiet beauty of the Strait of Juan de Fuca with the Olympic Mountains as a backdrop. Many years later, he would recall the “dull Sunday emptiness” of city streets. He had no way of knowing at the time, but in several months his own voice speaking over shellfire on the battlefields of Italy would bring news of the war into Canadian parlors. His teltale voice remains strong, his elocution precise. For Mr. Stursberg, now 96, retelling the events of a spectacular September in British Columbia 70 years ago revives memories of a war he experienced as few others did. Desperate to become a war correspondent, he quit print journalism to join the Canadian Broadcasting Corp., a decision regarded as madness by many of his fellow reporters. He debuted on an agricultural show. Soon, though, Mr. Stursberg’s eloquent reports, delivered in a memorably stentorian tone, his British parentage echoing in every crisply enunciated syllable, became familiar to every household with a radio across the Dominion. He became the first Allied correspondent to broadcast for a home audience the wartime love song “Lili Marlene,” which British and German troops alike in North Africa listened to as the tune closing a day’s broadcasts on Radio Belgrade. On landing with Canadian forces in Sicily, Mr. Stursberg was surprised to hear peasants singing the tune in the fields. A local orchestra, including an operatic tenor, was hired, and he recorded their version of a sentimental song about a soldier’s unfulfilled promise to meet a lover under a lamppost. It was in Sicily, too, where he recorded the ringing of church bells and the Seaforth Highlanders playing a victory salute at Agira, the first sounds of liberation in the Italian campaign. Canadian technicians and engineers cobbled together a mobile broadcasting studio inside an army truck dubbed Big Betsy. Disks were then dispatched from the war zone to London and on to Canada, a difficult and roundabout route. Mr. Stursberg’s eyewitness accounts brought an immediacy to war reporting. As the Canadians began an artillery assault on the Hitler Line, the German’s defensive position in central Italy’s Liri Valley, the correspondent peered through a shell hole in the attic of a farmhouse to describe the scene. He drove through the Netherlands in a chauffeured jeep, joined in the expedition by an Associated Press correspondent. They were quickly mobbed by jubilant civilians. “We were greeted wildly,” he said. “All kinds of Dutch girls got into our jeep. We were covered in girls as we drove through Holland. On Dominion Day, 1945, Mr. Stursberg entered Berlin. The war in Europe had ended more than six weeks earlier, though, of course, the German capital remained rubble. He descended the 36 steps into the bunker that was the final headquarters of the Nazis, his Soviet tour guide Major Feodor Platonov, whose shock troops had entered the Chancellory. The rooms were in a shambles, thick layers of soot covering floors filled with the detritus of a nightmare. Much had been looted. After cleaning, it was discovered one of the pieces of silverware carried the initials AH. Years later, he would display the souvenir for a CBC television audience. He has it still. In the post-war years, Mr. Stursberg covered the United Nations for CBC Radio before writing a series of books during the decade in which John Diefenbaker and Lester Pearson did political battle in Ottawa. About three decades ago, he had built a home in West Vancouver with a spectacular view across Burrard Inlet to the city. A garden beneath towering conifers was fragrant of lilacs on dry mornings, of what his wife liked to call a bosky smell of moss and ferns on the many damp mornings. A year ago, the former Jessamy Robertson, his wife of 62 years, died. “I’m alone here now,” he said. In an hour-long conversation, it is the only time his voice — once strong enough to be heard over shellfire — cracks. He published his most recent book, his 14th, seven years, at age 89. “No Foreign Bones in China” retraced his family’s colonial roots to where his father served as a postal commissioner and where he was born in Chefoo less than a year before the outbreak of the Great War. Mr. Stursberg was invested in the Order of Canada 13 years ago, two days after Remembrance Day. He is also a life member of the Parliamentary Press Gallery. Sometimes, he hears his old reports rebroadcast on History Television, or on the CBC, for whom his son, Richard, is executive vice-president of English services. On some midweek mornings, Mr. Stursberg is driven to a coffee shop at the Caulfield Village Mall, where he discusses books and current events with friends, all of them younger than himself. He finds some solace in knowing much of his life’s work — his books, his recorded war correspondence, his priceless tape-recordings of politicians in the 1960s — have been preserved in archives for the future use of historians. He saw so much and yet knows he cannot bear witness forever.